ggbigQQ extends ggplot2 to allow the user to make a quantile-quantile plot with a big dataset. Specifically, geom_big_qq uses all the data provided to calculate quantiles, but drops points that would overplot before plotting. 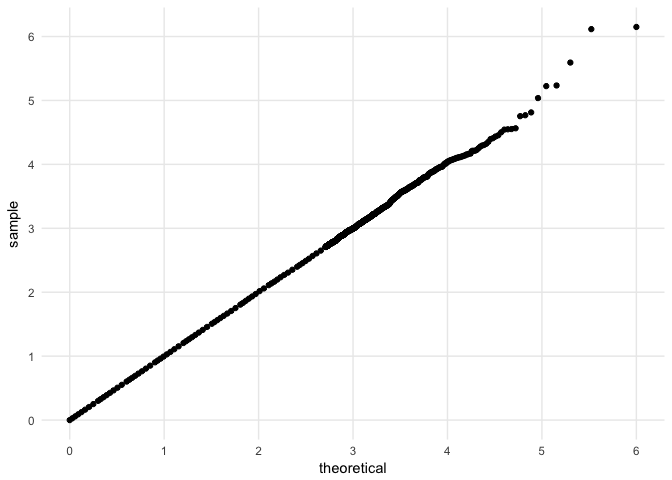 <!-- There's no use in having ten thousand points in a plot to define a line -- we can't even see most of them! --> In this way, the resultant figure maintains all the accuracy of a Q-Q plot made with a large dataset, but renders as fast as one from a smaller dataset and, when stored as a vector graphic, has the file size of a Q-Q plot from a smaller dataset. Here's an example where geom_qq takes 14 seconds to render the plot on my intel i5 and geom_big_qq takes 1 second to produce the same plot. This geom works with other aesthetics, too.